The first two of these placer gold prospects are in the Fortymile River watershed which flows out of Alaska into the Yukon River approximately 48 miles downriver from Dawson City and the Klondike River. These properties have Water Licenses and Class 4 Mining Land Use Permits. An Investment-Based Profit Sharing Partnership. 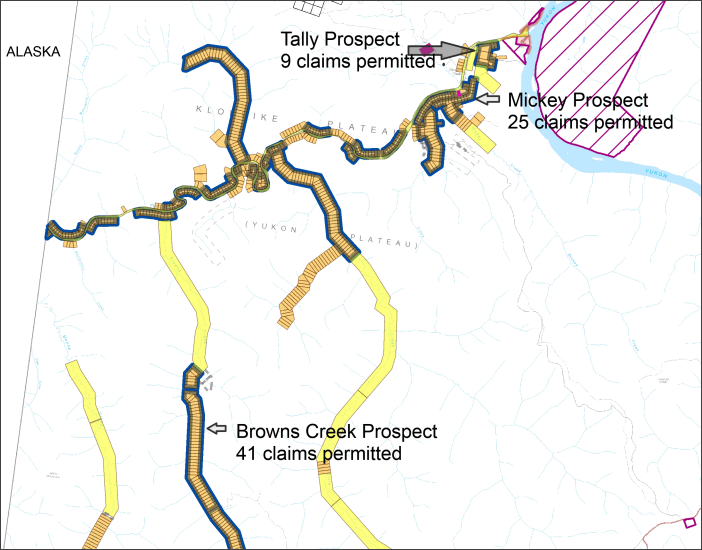 41 ready-to-mine placer claims on Browns Creek, Yukon Territory, grouped, with all permitting in place. Browns Creek is currently being placer mined both above and below the BCP claims. The Browns Creek Partnership is currently composed of four partners operating under contractual agreement. It initially was formed between Grant Allan and Sean Payne in April 2010. The partnership has, to date, functioned as a placer ground management unit, meeting assessment obligations, obtaining licensing, and prospecting the claims. It is expected that as prospecting progresses it will become small scale mining, and the process of exploration and mining will continue to evolve in a manner that suites the deposition model of the creek and the natural environment. The purpose of this report is to elicit interest and support for mining of Browns Creek placer deposits. All enquiries are welcomed. Value is deemed at $6,000 a claim. At this point, over the winter 2017/2018 the partnership is currently looking a buyer to purchase up to the top 20 claims including the Water License PM13-045 and Class 4 Mining Land Use Permit AP13045, good till 2024. 80 km from Dawson City Yukon, Browns Creek is located in the Forty Mile River watershed, entering the Forty Mile River from the south. Its headwaters are bordered by the Top of the World Highway which runs along the ridge separating the Sixty Mile River and Forty Mile River watersheds. Browns Creek is approximately 30km long, the last creek on the south side of the Forty Mile River to be fully within the Canadian border. The next creek up the 40 Mile River (West) is Moose Creek, featured in the television series, “Yukon Gold”. Moose Creek crosses the US border before entering the Forty Mile. Downstream (East) from Browns Creek is Bruin Creek, which has reportedly produced well when mined in the past and as yet is largely untouched. Placer mining in the Forty Mile River watershed has a history dating to before the Klondike Gold rush. The town site of Forty Mile, at the confluence of the Forty Mile and Yukon rivers, was the Yukon Territory's first settlement. The town was largely abandoned by early prospectors at the onset of the Klondike Gold Rush in 1898. Dredges operated on the Forty Mile River in the early to mid-20th century and the remains of at least two can be seen along the river. Browns Creek is 30km upstream from the confluence Forty Mile and the Yukon Rivers. It shows little signs of mining beyond a short lived rush in the 1980's, which brought roads into the steeply carved creek, and was cat-mined over less than 10% of the creek bed. Falling gold prices resulted in the withdrawal of placer miners from Browns, many of whom had come from Alaska - fleeing growing environmental regulation there. The placer ground at Browns remained largely open until 2009, when rising gold prices and falling markets brought renewed interest in its placer gold reserves. Browns Creek is positioned north of the historically and currently gold producing tributaries of the Sixty Mile River (Miller, Glacier, Big Gold), which were actively mined before, during, and for many years after the Klondike Gold Rush. There are still many active mines in the Sixtymile. The upper Fortymile River in Alaska has produced 500,000 oz. of placer gold. There is road access via Top of the World Highway in the Yukon and Taylor Highway from Alaska, and then north down the ridge road between Browns and Bruin Creek. Mickey Creek Fortymile Placer Gold Prospect in the Fortymile River watershed. 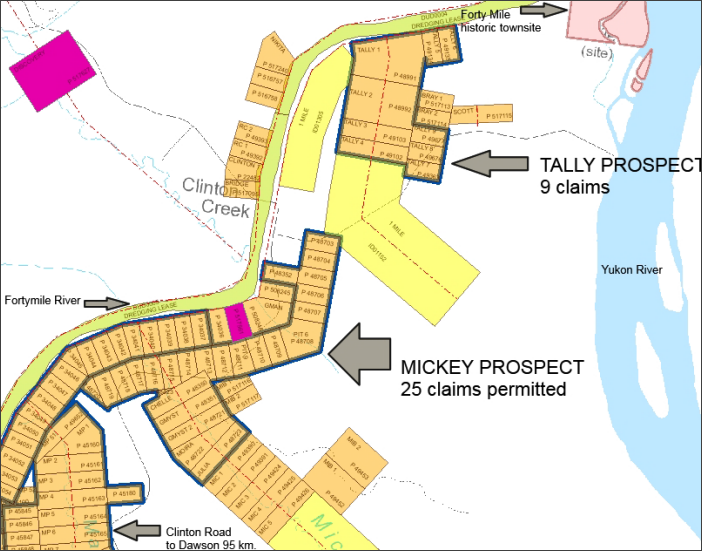 The Mickey Creek Prospect consists of 25 permitted claims and a camp with an insulated shack and cabin on skids, and two camper/trailers beside Mickey Creek. A Water License and Class 4 Mining Land Use Permit are in place (PM08-603). Gold is present throughout the Fortymile watershed and concentrations – economic pay channels - need to be found. There are two operating gold mines in the valley and increasing staking activity. 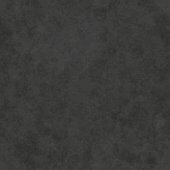 Over 500,000 oz. of gold has been mined in the Alaska side of the Fortymile watershed. Drilling and testing has showed some gold and more exploration is recommended and perhaps bulk testing where there is unthawed ground adjacent to the government maintained Clinton Rd.. Asking $14,000 for campers and shack and cabin on skids including some other items, and $3,500 a claim. For all permitted claims, camp, cabin and Water License and Mining Land Use Permit price is negotiable. Eight placer claims across the Yukon River from Dawson City. Access all year round via Top of the World Highway. 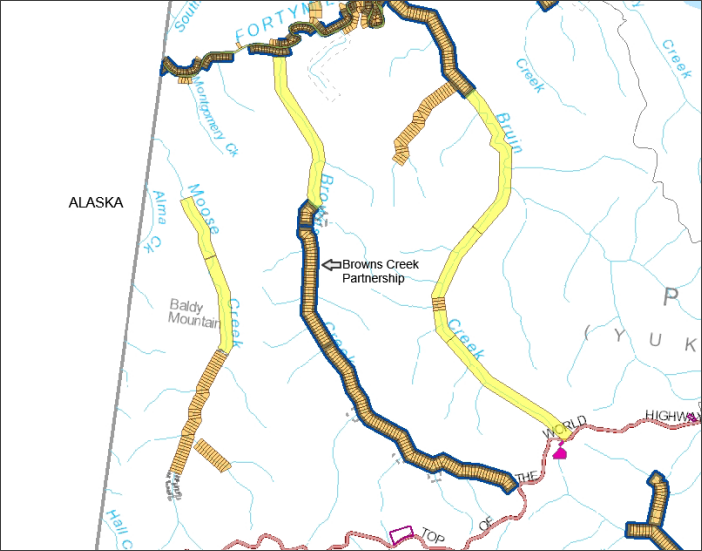 The Calder Creek Prospect in the Klondike Goldfields includes 37 claims on Calder Creek which flows south-east from the Eldorado summit into Quartz Creek. Drilling and shafting has recovered placer gold and more exploration is needed to delineate the gold bearing paleochannel. In 2016 Ground Truth Exploration did a Resistivity survey and UAV Drone Aerial Photogrammetry survey and RAB Drilling. Holes 16CLD002 to 16CLD006 returned 20 mg. and 55 mg. of gold. The DC Resistivity gave some insight into the location of water, gravel and bedrock. The discovery of a small but significant amount of gold is worth following up with a shafting program of perhaps 4 shafts, located where the gold was found to get to bedrock there and elsewhere on the bench. Digging shafts and drifting at bedrock to get large samples would determine a grade of gold at those locations. A drill program with the RAB drill or and auger drill would be useful to determine bedrock depth and test for gold at other locations on the right limit bench. This claim block is valued at $122,500.